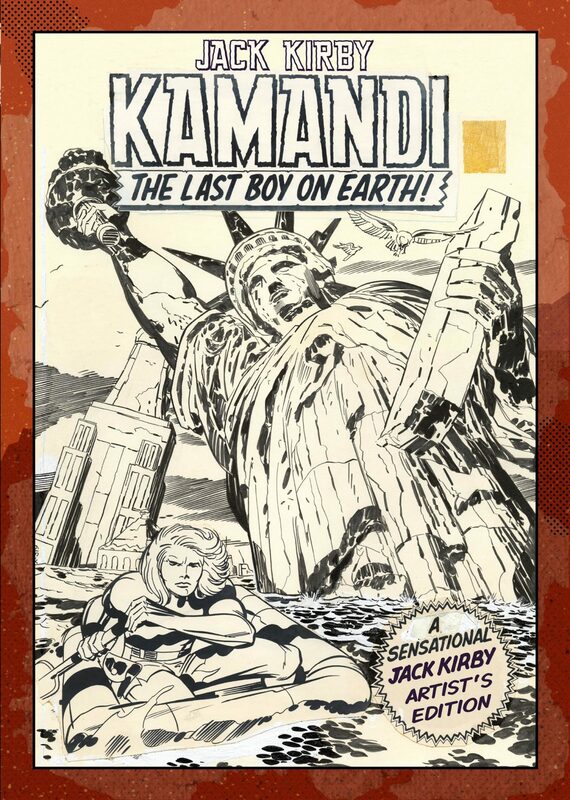 Jack Kirby’s Kamandi, The Last Boy on Earth, Vol. 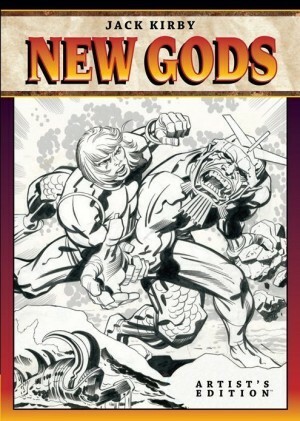 1: Artist’s Edition features six complete issues of original art from the series drawn by Jack Kirby and inked by Mike Royer; issues 1, 2, 5, 6, 7, and 9. There are also six pages from issue 3 and three pages from issue 4, plus a spread of pencil sketches. 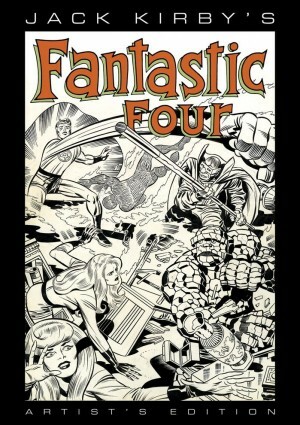 This is the third in the IDW’s Artist’s Editions series to feature the art of Jack Kirby, each a large hardcover book. The size is determined by the size of the original art, usually 430 x 304 mm, containing reproductions of original artwork which have been photographically scanned in colour at very high resolution and then printed actual size, on heavyweight paper. This process produces the sensation of looking at original drawings exactly as created by the artist with all the pencil marks, corrections, different pens and inks and other artefacts visible. These handmade traces are not visible when printed at reduced size, so these pages can often appear very different to the familiar comics versions. 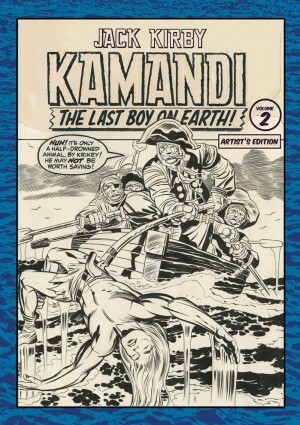 Kamandi: The Last Boy on Earth ran longer than all other Jack Kirby DC Comics creations, lasting 59 issues from 1972 to 1978, although Kirby only wrote the series to its 37th issue, and left Kamandi after drawing the 40th issue in 1976. 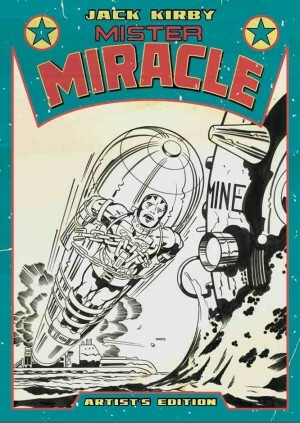 All of the art produced by Kirby for his DC books and subsequent later books appears different to his Marvel work, because Kirby’s two chosen inkers Mike Royer and D. Bruce Berry followed Kirby’s pencilled art and lettering styles completely faithfully with no erasures, additions, or embellishments of their own. These pages appear less ‘smoothed out’ than Kirby art typically inked by Vince Colletta and at this large size there is considerable energy and punch to the distinctive drawing that is exciting to look at. 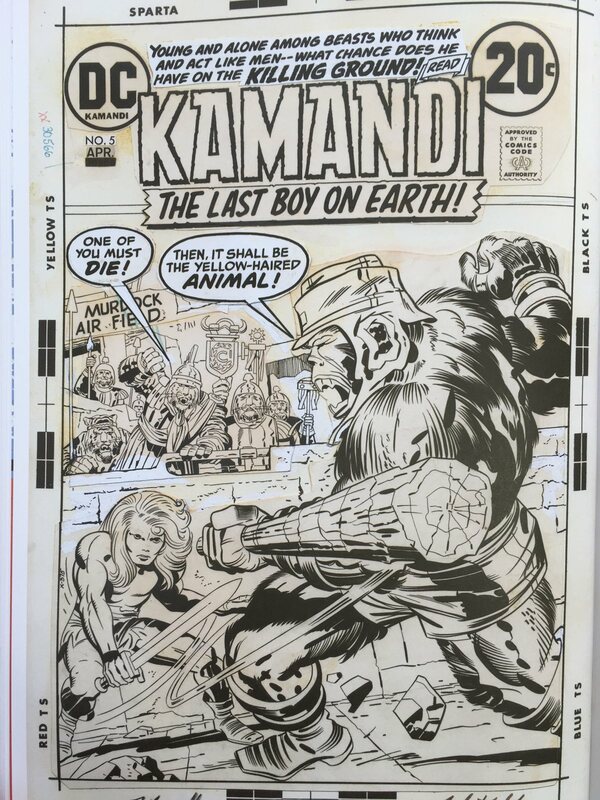 There is more Kamandi original art to be seen in a second Artist’s Edition of this series which reproduces issues 11 to 16: Jack Kirby’s Kamandi The Last Boy on Earth, Vol. II: Artist’s Edition.